The first run of episodes from the new animated series Forces Of Destiny, which were released this Summer, featured a variety of beloved characters from across the saga. It has be announced that a new batch of episodes is on the way, and they will include even more classic Star Wars characters. Now it has been confirmed that two more classic characters will be making their debut on Forces Of Destiny. Jedi News reports that in the latest issue of Star Wars Insider, it was confirmed that both Han Solo and Finn will be making appearances in some upcoming episodes. In an interview conducted by Tricia Barr, the Lucasfilm Story Group's Carrie Beck confirmed the news, and also added the John Boyega will reprise his role as Finn in the series. 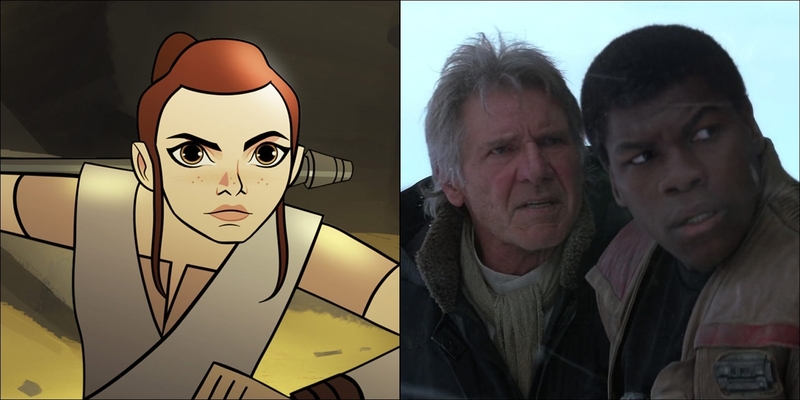 The actor who will be voicing Han remains a mystery, so it will be interesting to see who they pick(Harrison please?). More episodes of Forces Of Destiny are expected to be debut this Fall!